Wandering around the Artisans Bazaar in Addis this weekend highlighted the impressive culture in Ethiopia for unique, handmade, beautifully crafted items – weaving, paintings, baskets, coffee pots, natural cosmetics, scarves, the list goes on. 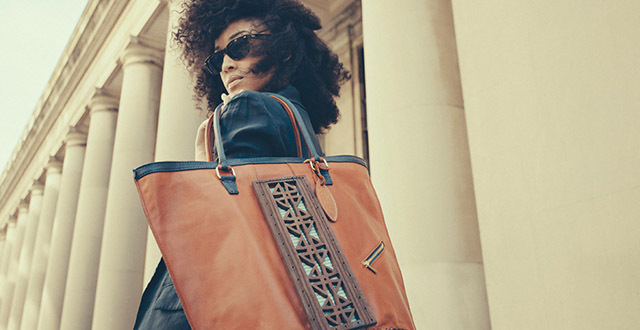 Amongst the traditional, are an emerging generation of artisans who are putting Ethiopia on the map for producing high-end luxury products, desired the world over. Amongst these is Abai Schulze, a lady full of business acumen, high design and a warmth that makes you want her as a friend. Abai is Founder and Creative Director at ZAAF – a collection of luxury apparel and leather accessories produced by Ethiopian artisans. Abai combined her background in economic development and love of fine arts, to create a business that, quite frankly, wouldn’t be out of place in Paris, London or New York. The ethos behind ZAAF however, the hands on involvement Abai has in design decisions and the personal way in which each visitor is welcomed to the showroom, is distinctly Ethiopian – reminding you that you’re in the beautiful land of artisans. Initially, Abai employed six artisans to create the first two collections; as the business rapidly builds, so too is the team, with nearly 20 staff now employed by ZAAF. I had the pleasure of interviewing Abai recently, to find out a little bit more about ZAAF and the journey the business has been on since launching internationally in February 2014, and within Ethiopia just over a year later. Congratulations on the recent opening of your first showroom in Addis Ababa – what is it like and has it been well received? We were overwhelmed and encouraged with the outcome of the showroom launch. People were pleased to see ‘Made in Ethiopia’ products that have been so well received internationally, now available here in Addis. How important was it for you to be able to retail in your home country? It was an important move for us – we want to challenge and inspire the local design and creative class here in Addis and really pass the message that consumers do demand good quality made from the best Ethiopian materials by Ethiopia’s talented people. Where does your interest in fashion and design stem from? My driving passion and vision for many years was centred around using my education and experiences to create economic opportunities in my country of birth. So ZAAF comes out of a convergence of both opportunity and passion. I understood the value of my education and strong family support in the US, and the possibilities to capture and capitalize on the potential and trends of my home country. My passion for design and creative expressions has always been a driver for me, even though I spent my university years focused on the hard facts of economics. Nonetheless, I was able to continue my creative development and skills with a fine arts minor. How do you source the materials for your products, and how important is it for you to source from within Ethiopia? Ethiopia is home to the largest population of livestock in Africa, with over 40 million people owning livestock. This country produces some of the finest leather in the world. All the raw materials at ZAAF (leather and handwoven textiles) are sourced from Ethiopia and handcrafted by local talented artisans. We strongly believe that real economic development is about producing top quality products using unique cultural, natural, and human resources that can compete anywhere in the global marketplace. What has been your proudest moment with the business? Unfortunately, the “Ethiopia brand” is stuck in the stereotypes of hunger and instability, rooted in events of the past. This brand needs to be updated to reflect the reality of the nation’s amazing growth and human and cultural capital. Our mission is to celebrate and promote Ethiopia as well as the entire continent’s rich cultures through exacting top quality products made with indigenous natural resources by our gifted and brilliant artisans. One of my proudest moments, was seeing this mission in action – seeing ZAAF on the runway at New York Fashion Week, and being highlighted by top fashion magazines including Elle, Lucky and Vogue amongst others. Your bags have a signature (and beautiful!) block of fabric included. What has been the inspiration behind the designs in your collection? For us, it is important that our consumers feel the sense of where their products are made. In our collections, we integrate ageless patterns created on traditional looms, with leather. The fabrics we use are made by talented weavers, who meticulously count knots to produce patterns with a fantastic combination of colours and styles – their skills are handed down through generations. ZAAF utilises these resources in a way that means we can support and advance traditional industries to cater to the global market, without compromising their identity. We merge traditional techniques with modern designs. Where would you like to see ZAAF Collection in five years’ time? In five years, we hope to create a luxury lifestyle brand – under the notion of “Made in Africa” that recognises brilliance in craftsmanship and artistry while celebrating the rich heritage and culture of the continent. If you had just five words to describe ZAAF Collection, what would they be? Classic. Chic. Authentic. Functional. Bold. If you could give one of your bags to anyone, who would it be and why? It would be an honour if we could give one of our bags to Catherine, the Duchess of Cambridge. She has her own unique sense of classic style – one of elegance and grace. I think one of our ZAAF bags would complement her very nicely. As a successful Ethiopia business woman, what advice would you give to Ethiopian girls and women seeking to achieve their dreams? Find something that you are truly passionate about and build a vision for it – think big, but start small. Surround yourself with people who can challenge you and hold you accountable for your actions and progress. Indeed, this is advice that everyone can take something from. Abai is an inspirational example of a lady who knows what she wants to create, and no matter what obstacles confront her, she finds a way to make it happen. I get the feeling that what she has created is on the cusp of exploding into a really exciting brand, recognised the world over. ZAAF’s showroom is just behind Shala Park, in Addis Ababa – I urge you to make the time to go for a visit…you’ll want to leave with one of everything! A well written article which will encourage anyone who reads it to seek out ZAAF products, not to mention consider booking a trip to see this lovely country. Great article! Abai is amazing! She pays attention to detail and the craftsmanship of a ZAAF leather handbag is undeniable!